Chelsea and Tottenham faced off at Wembley Stadium last Sunday in the Capital One Cup Final. It&apos;s one of two domestic cup competitions that Premier League fans don&apos;t care about until they&apos;re actually in the final (the other being the "magical" F.A. Cup). Before the match, and as you can see from the video above, a couple of Chelsea fans were engaging in some standard heckling. They were undoubtedly pumped to go on and watch Jose Mourinho&apos;s first-placed Premiership side demolish Tottenham 2-0, and were rightly feeling themselves. Chelsea and Tottenham are crosstown London rivals, and with Chelsea fans not being on their best behavior—scratch that—with Chelsea fans acting like total fuccbois recently, they were able to easily provoke a pack of wandering Tottenham fans. In response, a beer was tossed, which is the international fan symbol for "LET&apos;S GET IT ON." 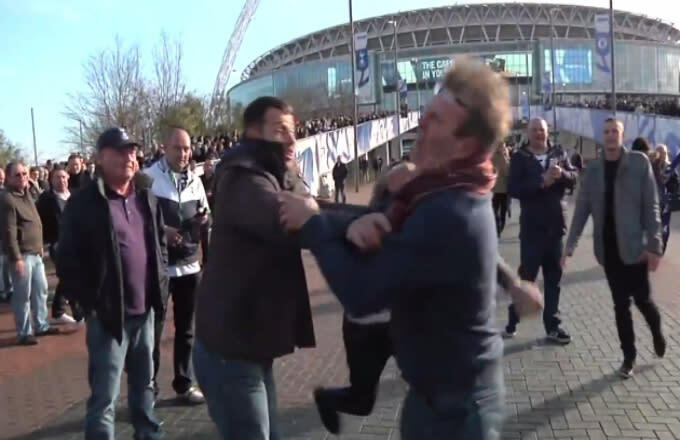 About 20 seconds into the video, a middle aged Chelsea fan gets clocked in the face by a young Tottenham lad. 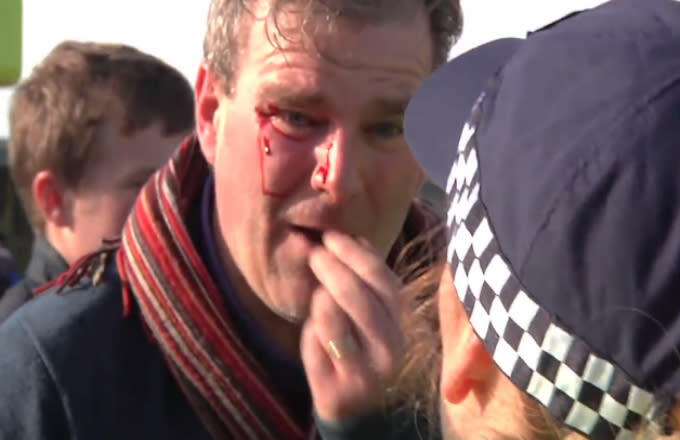 The man&apos;s glasses broke on his face, and a bit of blood was spilled on Wembley&apos;s grounds. Just another day in the life of a raucous Chelsea fan.